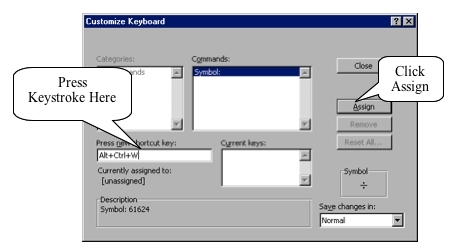 Picture this: You're in class or at home, trying to get your steno machine and CAT software to display the  (trademark) symbol ... but you can't find it on your computer keyboard! Well, if this hasn't happened to you, count your blessings ... but if it has happened to you, thank Maria Garrido for this article; for she was kind enough to share her solution for this most annoying problem! I know it seems that there are a lot of steps, but trust me they are not that complicated, just follow one after the other and I think you will not have any problems. You can choose any combination that is available. You do not have to use the ones I am using here. I tried to use as many screen pictures as I could so as to make it a little easier to understand. 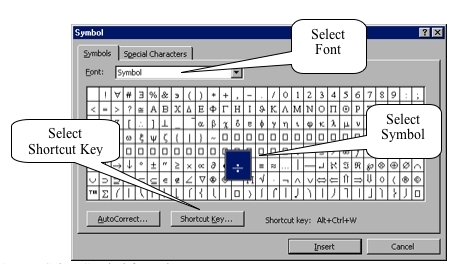 You will first attach keystrokes in MS Word and then you will do the same thing in the Steno software. When you need a division symbol, simply press CTRL+ALT+W on the regular keyboard and the ÷ will appear. When you need a division symbol using the steno machine, simply press TKW-D and the ÷ will appear. I think you get the idea. Let's get started. 1. Press CTRL+N to get to a blank document. 3. Select Symbol from the Font menu. 4. Click on the Division Symbol to select it. 5. Click on Shortcut Key. 6. Click on the "Press new shortcut key" and press CTRL+ALT+W together. If the keystroke is available it will say "Currently assigned to: [unassigned]." If is not available, please create another combination. 7. Write the combination down as you will need to remember it for the Steno. 10. Repeat above steps for each individual symbol you want to create. 11. Click on Close to go back to the document.